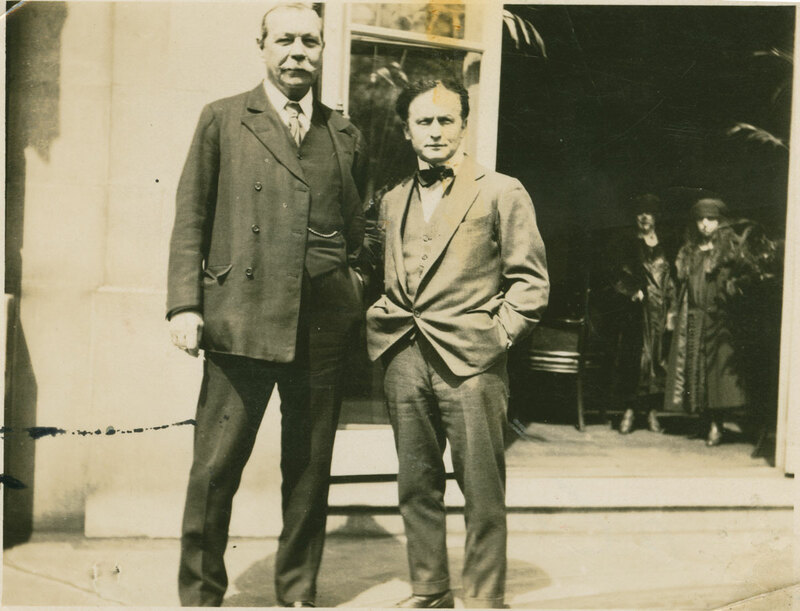 The Ransom Center recently launched a new platform of digital collections on its website, which includes the Harry Houdini scrapbook collection. 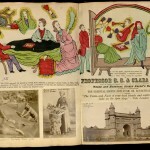 More than 50 items from that collection, including the scrapbook highlighted in this blog post, can be viewed on the new platform. American magician S. S. Baldwin (1848–1924), also known as “The White Mahatma,” was a celebrated mind reader or “mentalist” who made several tours around the world, initially with his wife and partner Clara Baldwin, and later with his second wife, Kittie Baldwin. The centerpiece of his act was a question-and-answer session in which he hypnotized his wife. Under his spell, she would answer questions from the audience without having heard the questions. Like his contemporary Harry Houdini, Baldwin insisted that he did not possess any supernatural powers, and he sought to expose spiritualism as trickery. In 1924 Baldwin’s daughter Shadow sent Houdini her deceased father’s scrapbook from his fourth tour around the world. 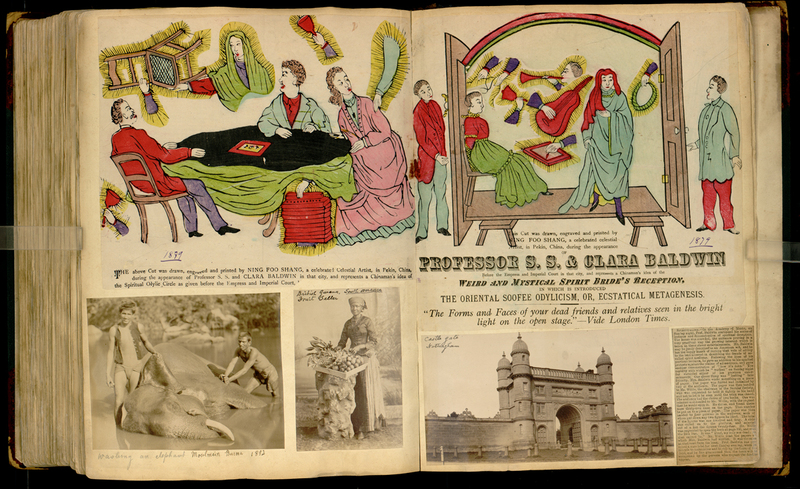 This magnificent scrapbook is an eclectic mix of photographs from places he traveled, juxtaposed with printed notices of his performances and other items. Many of the images reflect Baldwin’s interest in the indigenous peoples of the countries he visited. The first image shows a piece of Baldwin’s stationery from his fifth world tour, ca. 1889–1890, embellished with skulls and devils. The second image features an engraved notice for Baldwin’s performances in Peking, China, in 1879, pasted above a review for an appearance at the Academy of Music (city and date unknown). Notably, the engraving was designed and printed by a local Chinese artist, Ning Foo Shang. Also included are photographs from Burma, British Guiana, and, somewhat incongruously, England (one photograph is labeled “Castle Gate, Nottingham”). 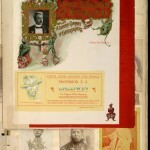 This page in the scrapbook shows a piece of American magician S. S. Baldwin’s stationery from his fifth world tour, ca. 1889–1890, embellished with skulls and devils. 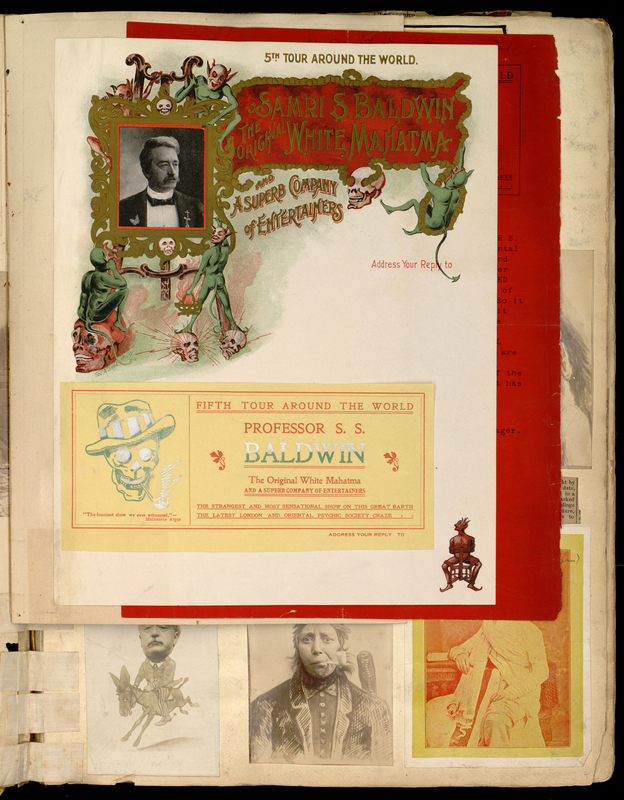 This page in the scrapbook highlights an engraved notice for S. S. Baldwin’s performances in Peking, China, in 1879, pasted above a review for an appearance at the Academy of Music (city and date unknown).